"SDTV" redirects here. For a television broadcasting network in Shandong Province, see Shandong Television. 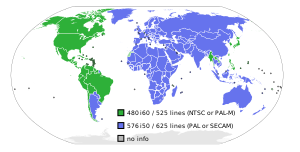 SDTV resolution by nation; due to historical reasons, different countries use either 480i or 576i as the standard-definition picture format. Standard-definition television (SDTV or SD) is a television system which uses a resolution that is not considered to be either high or enhanced definition. The two common SDTV signal types are 576i, with 576 interlaced lines of resolution, derived from the European-developed PAL and SECAM systems, and 480i based on the American NTSC system. SDTV and high-definition television (HDTV) are the two categories of display formats for digital television (DTV) transmissions. SDTV refresh rates can be 24, 25, 30, 50 or 60 frames per second with a possible rate multiplier of 1000/1001 for NTSC. 50 and 60 rates are generally frame doubled versions of 25 and 30 rates for jitter issues when using non-interlaced lines. Digital SDTV in 4:3 aspect ratio has the same appearance as regular analog TV (NTSC, PAL, SECAM) without the ghosting, snowy images and white noise. However, if the reception has interference or is poor, where the error correction cannot compensate one will encounter various other artifacts such as image freezing, stuttering or dropouts from missing intra-frames or blockiness from missing macroblocks. The audio encoding is the last to suffer loss due to the lower bandwidth requirements. Television signals are transmitted in digitally encoded form, and the lines are scaled to fit SMPTE SDI bandwidth requirements, as opposed to unrestricted uses such as when lines are rendered or overlaid to a modern computer monitor and modern SMPTE implementations of HDTV. The table below summarizes pixel aspect ratios for the scaling of various kinds of SDTV video lines. Note that the actual image (be it 4:3 or 16:9) is always contained in the center 704 horizontal pixels of the digital frame, regardless of how many horizontal pixels (704 or 720) are used. In case of digital video line having 720 horizontal pixels, only the center 704 pixels contain actual 4:3 or 16:9 image, and the 8-pixel-wide stripes from either side are called nominal analogue blanking for horizontal blanking and should be discarded before displaying the image. Nominal analogue blanking should not be confused with overscan, as overscan areas are part of the actual 4:3 or 16:9 image. The pixel aspect ratio is always the same for corresponding 720 and 704 pixel resolutions because the center part of a 720-pixel-wide image is equal to the corresponding 704-pixel-wide image. An SDTV image outside the constraints of the SMPTE standards requires no non-proportional scaling with 640 pixels[e] for every line of the image. The display and pixel aspect ratio is generally not required with the line height defining the aspect. For widescreen 16:9, 360 lines define a widescreen image and for traditional 4:3, 480 lines define an image. ^ Some broadcasters prefer to reduce the horizontal resolution by anamorphically scaling the video into a pillarbox. ^ Only 704 center pixels contain the image and 16 pixels are reserved for horizontal blanking. A number of broadcasters fill the whole 720 frame.